Shopfront mannequins are falling to pieces. There was a time when a mannequin was the sculptural equivalent of fashion model. Like a fashion model, the mannequin was intended to reflect our social, professional and aesthetic aspirations. Although she was permanently frozen in an idealistic tableau – artificial in every sense – she represented a living human being. Seeing her hacked into pieces, with body parts scattered across a shop floor, I am reminded of the scene of a brutal murder. 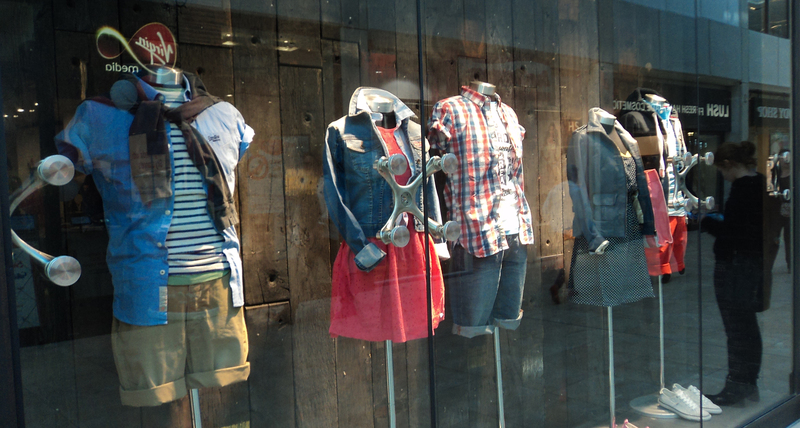 Mannequins in GAP are dismembered, with body parts spread across the store. At GAP, mannequins appear to have been sliced in two, with legs on one side of the shop and dismembered torsos on the other. More widespread is the practice of simply lopping off the head or legs. Headless mannequins seem to have become the norm. Some of these mannequins have been reduced to resemble dressmakers’ forms. This reverts to the style of some of the earliest shop mannequins of the 1850s, which were headless dress forms made from wicker or cane. Such mannequins were not designed to express personality or lifestyle; just to display the silhouette of the garment. In such close imitation of a dressmaker’s dummy, the mannequin draws attention to the creation, rather than the wearing, of the clothes. We are reminded of the dressmaking process, and the labour that goes into making the garment. Some headless and limbless mannequins resemble dressmakers’ forms. This reminds us of the labour of the dressmaking process. In the 1870s, heads and limbs were introduced to make the mannequins more representative of the customer. For the next 60 or 70 years, manufacturers went to great lengths to achieve realism, even using real hair and live models . 1920s mannequins began to be seen as expressive rather than simply functional. The addition of interchangeable arms and moving parts in the 1930s allowed them to express with their entire bodies, and they could be seen to be engaged in activities which were a reflection of a lifestyle. Over the following decades, mannequins went through periods of realism and artistic expression, always representing a customer’s body or values. Like models in fashion photography, mannequins began to appear in staged scenes and against styled backdrops. The shop display became an opportunity for retailers to associate a set of ideals and values with the garments on display. What we see in the highstreet today seems to contradict the established purpose of a mannequin, as well as the rules of marketing. The removal of the head imposes anonymity. These bodies could belong to anyone and everyone. 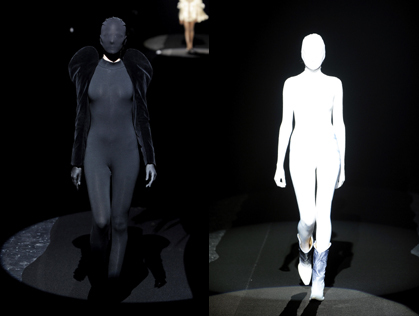 Faceless anonymity is also a tactic employed by Maison Martin Margiela in his catwalk shows. Margiela is infamous in his anonymity. He does not explicitly claim ownership of his designs. At Maison Martin Margiela, clothes are given plain white labels, bearing no name. This anonymity and invisibility is a practice continued throughout the entire branding and distribution process. Margiela stores are not identified with signage. Within the stores, staff wear white lab coats with no identifiable marks, and white sheets cover the furniture in the stores. Anonymity even extends to Margiela’s shows, in which models often walk the runway with covered faces. Anonymous models for Martin Margiela. Generic, anonymous mannequins on the highstreet. Without a face to represent an ideal, models or mannequins become unable to represent the target consumer or his/her aspirations. Instead, they imply a kind of democracy in which the consumer could be anyone. The consumer cannot directly see him or herself reflected in the mannequin, and so the retailer opens itself up to any possible consumer. 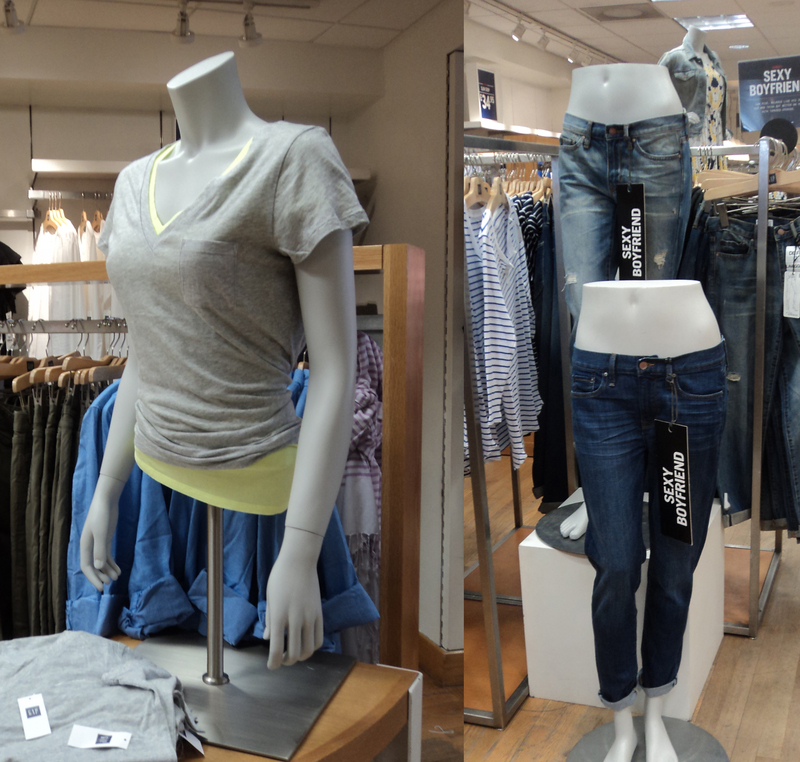 The headless mannequin tries not to impose an idea of who its target consumer may be. Even where heads are still used, they have become blank and expressionless. Some are dehumanised: coated with cloth or pattern. They are generic, anonymous – like cloth dolls or androids on a production line. These two tactics seem to make sense independently of one another. The dressmaker’s form is effective at invoking ideas of dressmaking, and the headless mannequin is effective at broadening a target market to include any possible customer. Problems arise when we see a half-hearted or confused approach to reducing the body. The mannequins in the window of GAP Kids are posed expressively, as if the bodies are having fun, but their heads are missing. It is as if these bodies have been decapitated mid-play. The result is an unsettling compromise between liveliness and lifelessness. They are alive, but without personality or identity. 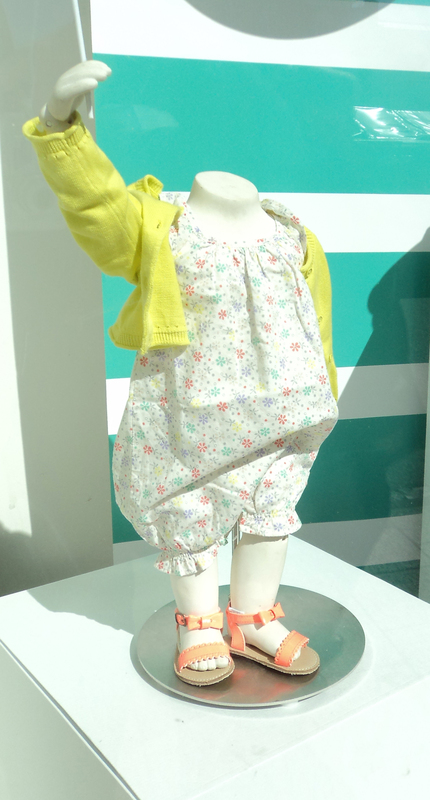 Mannequins at GAP Kids are headless yet animated – simultaneously lively and lifeless. Thesander, Marianne, The Feminine Ideal, London: Reaktion Books, 1997, 75. Schneider, Sara K., ‘Body Design, Variable Realisms: The Case of Female Fashion Mannequins’, Design Issues Vol. 13, No. 3 (1997), 7. Mackenzie, Mairi, …Isms: Understanding Fashion, London: Herbert Press, 2009, 120. All other images: author’s own.